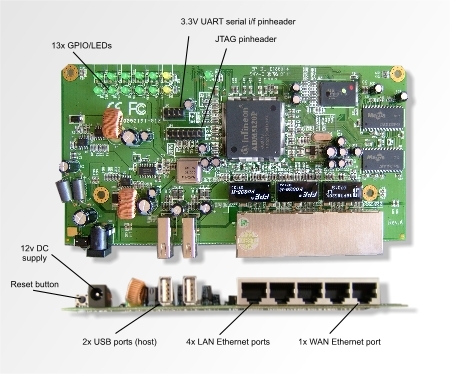 Embedded Controller v1 was first released in 2007. 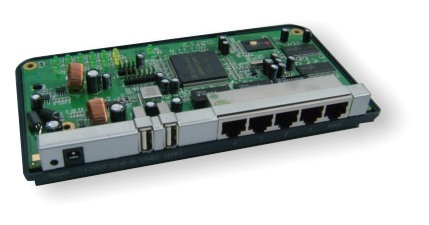 Due to the limited supply of the ADM5120 SOCs and the availability of updated version 2 hardware with more powerful features this product is gradually being phased out during 2013 and 2014. Embedded Controller v2 is now available and provides additional features such as USB2.0 OTG, WiFi and includes more flash and RAM - see Omnima MiniEMBWiFi for more details. Education: Cost-effective plug and play OpenWrt Squidge Linux running Java VM, mini-Python and other standard OpenWrt packages, simple to setup and use Virtual Machine based SDK. No programming is required. The embedded contoller will boot directly from the USB flash disk and run Java VM, Python-mini, LUA, WGET and many other standard OpenWrt packages. This ships on a 4GB flash drive as standard. To reprogram this board you can now purchase a USB to UART adapter which includes a socket that connects directly to the serial pinheader on this controller. Connecting to the JTAG pinheader is useful when debugging Linux kernel issues. If this option is selected the controller board will be provided with the JTAG pinheader soldered on the board. Power supply adapter can be included as an option. The outlet plug on this adapter connects directly to the embedded controller power socket. See our forum for more information about this enclosure.